Calgary rang Philadelphia’s bell Saturday afternoon. The Riggers offence exploded in the matinee affair, beating the Philadelphia Wings 18-13 at Wells Fargo Center. “I thought we were good in the first half, we played really well and then there were a lot of penalties and the game got to garbage time,” said coach Curt Malawsky. 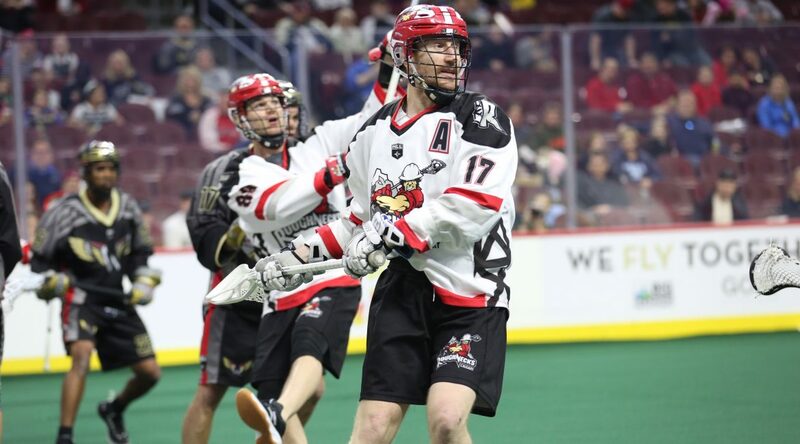 Dane Dobbie – the new scoring leader in the NLL with 99 points – was the catalyst behind the Riggers offence, netting four goals and seven assists. The output also broke previous his single-season career points record of 90. Curtis Dickson also reached double-digit points in the game, putting home four of his own along with six assists. Rhys Duch (2g, 4a), Riley Loewen (2g, 2a), Shane Simpson (4a), Dan Taylor (2g, 1a), and even Christian Del Bianco (2a) made solid contributions offensively for the Roughnecks. “We had some good transition goals from the guys in the backend at key points and then Dickson got some big ones, Dobbie got some big ones and then I thought the offence shared the ball really well,” said Malawsky. “We talk about offence by committee and that’s what it was. Calgary burst out of the gate, blanking the Wings 5-0 in the opening quarter. With 17 of his 46 saves coming in the first fifteen minutes alone, netminder Christian Del Bianco was a big reason why the Roughnecks were able to climb out in front and hold serve for the rest of the afternoon. “You look up at the scoreboard and you’re up by five with the shots heavily favouring them, that’s why we love Delbs so much. He’s our backbone,” Malawsky said. The early day match-up featured plenty of offence from both sides of the floor, something that was aided by the large number of penalties taken. Each team received seven power play opportunities and managed to match one another with four extra-man goals apiece. The Roughnecks will be back in action next weekend as they host the Georgia Swarm (7:30 P.M.) at the Scotiabank Saddledome on Friday, April 12.